It is making a difference by taking a barista on board to serve a freshly blended cup of Starbucks in smile plus class for the first time in Thailand to reinforce the full service of the airline that is opted to create smiles and impressions for all passengers in all flights. THAI Smile celebrates its move to the 7th year on the 7th of 7th month by delivering smiles and impressions to all customers with a special menu crafted by two partners, the biggest coffee house chain worldwide and king of dessert cafe: Starbucks and After You Dessert Cafe. 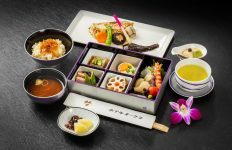 It is ready to serve such exclusive menu for all passengers through 7 days during 7 – 13 July this year. This is to highlight its full service that the airline is committed to offering and developing a service superior to its rivals. It is moving forward to the 7th year of services with a service development plan that focuses on improving delicate details without any impact on the cost. It also has a plan to open three more routes this year. 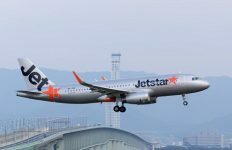 Recently, it has received the TripAdvisor Award for the second consecutive year for both the Best Regional Airline in Asia and The Airline with The Best Economy Seat in Asia (Best Economy Class in Asia) for the first time. Mr Chatchai Panyoo, Acting Chief Executive Officer of THAI Smile, revealed that during the past six years, THAI Smile made changes in its service strategies in various dimensions as to meet the needs of travelers. It has the goal of being a leading full-service airline in the region. The service is excellent, coupled with the value for money, to meet the needs of short-haul commuters, but at the same time, it also provides maximum comfort for passengers who require excellent services. On the occasion of stepping onto our 7th year of operation, our clients will see a change in our way to create customers’ satisfaction. We have also improved the existing service to be even better. Moreover, WE Smile magazine has been modified for its look with the passengers getting more involved. For all modifications and improvements THAI Smile will take into account the needs of passengers and deliver the new experience beyond their expectations. THAI Smile also plans to open two new routes comprising Bangkok – Guangzhou to replace the existing Phuket – Guangzhou, and Bangkok – Kolkata in the near future. Mrs Nednapang Teeravas, Chief Customer Service Officer of THAI Smile, said that Thai Smile is moving into its 7th year with a plan to develop a service geared towards modifying the service details, without effect on costs, such as changing the way to serve and be more flexible while maintaining service standards or serving styles. No tray is used, but it is a box with some modifications that can be served instead of a tray. Smile Bag Packaging has been adjusted. There is also a premium tinted seat cover with the use of gray tone in the Smile PLUS class. Furthermore, it also aims at developing and driving service providers to meet the requirements. Now, satisfaction survey has been done every month, and then brainstorming is in place to adjust the plans or solutions. However, it is necessary to go out to check the operations at scene more. In the future, THAI Smile will play more roles in ground operation, resulting in better control over Smile Service Rings. On the occasion of advancing to the 7th year of THAI Smile, on the 7th of July (7/7), THAI Smile will continue to make a never-lasting impression and endless surprise with its exclusive service by working with After You to tailor special menus including Trio Chocolate Fudge Cake (chocolate & marsh mellow cake topped with chocolate crumble), Strawberry Cheese Cake Verrine (layer cheese cake with strawberry sauce topped with crumbles), Mango Coconut Sago Pudding (blue pea tapioca pearl topped with coconut milk and mango sauce), served with Starbucks VIA(R) Italian roast, one of the latest innovations from Starbucks. It will be available for passengers in the premium economy class (Smile Plus) and Economy Class (Smile Class) in all seats for all domestic and international flights during 7-13 July this year. Besides, passengers in premium economy class (Smile Plus) will be surprised by a barista from Starbucks serving a cup of freshly blended coffee “Maun Jai Blend” and “Toast on Board” signature menu from After You. Currently, THAI Smiles has launched 10 domestic routes, including Chiang Mai, Chiang Rai, Hat Yai. Ubon Ratchathani, Udon Thani, Khon Kaen, Surat Thani, Phuket, Krabi, and Narathiwat. In addition, THAI Smile also provides regional flights between Chiang Mai and Phuket and 18 international routes to Yangon, Siem Reap, Penang, Changsha, Chongqing, Zhengzhou, Gaya, Varanasi, Jaipur, Lucknow, Mandalay, Vientiane, Phnom Penh, Kuala Lumpur, Kaohsiung, Luang Prabang, Mumbai and Phuket-Guangzhou route, with a plan to increase the frequency of domestic and international routes. More new international flights will be opened in the future.